Nottinghamshire increased the pressure on Glamorgan between lunch and tea on the second day of their Specsavers’ County Championship game at SSE Swalec. Having added 54 runs during a rain-affected morning session, they pressed on after lunch with Brett Hutton helping himself to a half century off 80 balls and Chris Read reaching 88 before falling to Lukas Carey at 427 for 7. After that and with Notts trying to up the tempo, wickets fell in quick succession as Glamorgan mopped up the tail in impressive fashion. Stuart Broad (7) departed at 438 for 8, Hutton fell to Carey for 61, four runs later and Harry Gurney (1) was comprehensively bowled by Timm van der Gutgen at 448. 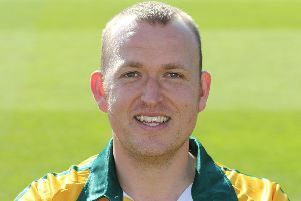 Keen to make early inroads with the ball, Notts broke through in the eighth over when Luke Fletcher had Nick Selman caught by stand-in wicket keeper Rikki Wessels for seven, at 11 for 1. Will Bragg (5) ran himself out at 20 for 2 and at tea, Glamorgan were 47 for 2 with Jacques Rudolph unbeaten on 24 and Colin Ingram nine not out.